Tickets to Experience OCT are available online until Noon on Thursday, April 25. After that, remaining tickets are available at the door or over the phone: 541-684-6988. Call to RSVP today, and reserve your spot! You're invited to our annual benefit to support OCT’s outstanding play productions, community outreach efforts and theatre education programs. OCT will host the event on April 28, 2019, at our home at 194 West Broadway. Engage with artists and arts supporters from throughout the community while enjoying our silent auction, wine wall and special guest performances. 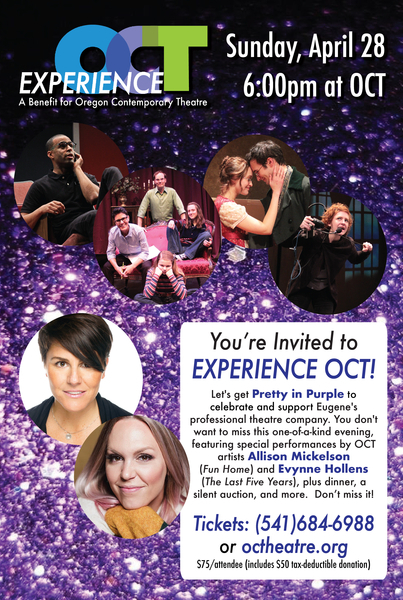 Join us for an evening of theatre, food, fun and support for one of Eugene’s leading arts organizations. We look forward to seeing you at the theatre! Unable to join us for the Experience OCT event? Consider making a donation in lieu of attending! Every gift helps us to create bold, dynamic theatre for years to come! For more information, contact Associate Producer Tara Wibrew: (541)684-6988 x204, or email Tara@octheatre.org.